BY DOWNLOADING, INSTALLING, ACTIVATING WITH LICENSE KEY OR OTHERWISE USING THE PRODUCT IDENTIFIED ABOVE AND/OR ITS RELATED MATERIALS, YOU AGREE TO BE BOUND BY THE TERMS AND CONDITIONS OF THIS LICENSE AGREEMENT. This license agreement ("LICENSE") is a legal agreement between you (either an individual or a single entity, also referred to as "LICENSEE", "YOU") and RainWeb LLC., d.b.a. RainWorx Software, ("RAINWORX"), for the software containing this LICENSE which may also include the software’s source code written in a high–level computer language, compiled binaries, database scripts, and "online" or electronic documentation (collectively referred to as "SOFTWARE"). LICENSEE must be lawfully able to enter into and form contracts under their own will. Any earlier license we may have granted to you for the use of earlier versions of the SOFTWARE is replaced by this LICENSE. The SOFTWARE is protected by copyright laws and international copyright treaties, as well as other intellectual property laws and treaties and contains confidential information and trade secrets. The SOFTWARE is licensed to you, not sold. RAINWORX retains ownership of the copy of the SOFTWARE in your possession, and all copies you may be licensed to make. RAINWORX also retains all rights not expressly granted to you in this LICENSE. RAINWORX hereby grants to you, and you accept, a NON-EXCLUSIVE, NON-TRANSFERABLE, AND NON-ASSIGNABLE LICENSE to install, copy and use the SOFTWARE only as authorized below. The AuctionWorx Enterprise LICENSE allows you to use the SOFTWARE for 1 (one) installation (consisting of a single database instance, a single set of website files, and compiled binaries) residing on a single web server. To facilitate the development process, RAINWORX allows you to deploy the SOFTWARE on your intranet development servers and access via the IP address(es). There is no limitation to the number of User accounts. You may not use the RAINWORX product names, logos or trademarks to market your SERVICES or IMPLEMENTATIONS related to the SOFTWARE without the express prior consent of RAINWORX. You agree to indemnify, hold harmless, and defend RAINWORX and its resellers from and against any and all claims or lawsuits including attorney's fees that arise or result from the use of your website or business. Independent software vendors involved in the development, maintenance and publication of ecommerce web applications or auction software are not allowed to use the SOFTWARE without the express permission of RAINWORX. You may not publish the results of any benchmark or comparison tests run on the SOFTWARE. You may not provide the results of any benchmark or comparison tests run on the SOFTWARE to any third party without the prior written consent of RAINWORX. You shall be responsible for the payment of all taxes, duties, or levies that may now or hereafter be imposed by any authority upon this Agreement for the supply, use, or maintenance of the SOFTWARE. RAINWORX shall deliver to LICENSEE a master copy of the SOFTWARE licensed hereunder in electronic format only. Documentation shall also be provided in electronic format. Installation of the SOFTWARE by RAINWORX on behalf of LICENSEE constitutes as an alternative delivery option. RAINWORX will provide, in its sole discretion, LICENSEE with error corrections, bug fixes, or patches to the SOFTWARE licensed hereunder. 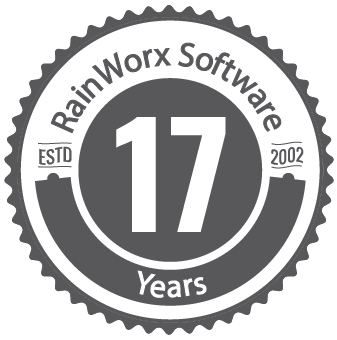 LICENSEE may, from time to time, request that RAINWORX incorporate certain features, enhancements or modifications into the SOFTWARE. RAINWORX may, in its sole discretion, undertake to incorporate such changes and distribute the SOFTWARE so modified to all or any past or future Licensees. RAINWORX reserves the right to publish LICENSEE’s name or corresponding domain names without prior notice to LICENSEE for the purpose of presentations, marketing materials, customer lists, or web site listings of customers. RAINWORX reserves the right to log usage of SOFTWARE at any time with the exception of user information, financial transactions, or any other confidential information. Only the LICENSEE’s software license key, website URL(s), site name, site title, server IP address, machine name, processor count, and server OS version is subject to being transmitted. All title and copyrights in and to the SOFTWARE, the accompanying materials, any copies of the SOFTWARE, and any trademarks or service marks of RAINWORX are owned by RAINWORX. All title and intellectual property rights in and to the content that may be accessed through use of the SOFTWARE is the property of the respective content owner and may be protected by applicable copyright or other intellectual property laws and treaties. All error corrections, bug fixes, patches, updates or other modifications, unless otherwise defined, shall be the sole property of RAINWORX. If ownership of a license is found to be in dispute and reasonable proof of ownership cannot be established, the license will remain with the registered owner until agreement can be reached on license ownership, and all parties notify RAINWORX to that effect. The LICENSE terms do not explicitly grant the right to transfer ownership from original LICENSEE; therefore any license transfers are at the discretion of RAINWORX. If LICENSEE wishes to transfer LICENSE, they should send a request to RAINWORX with full details. If LICENSEE submits a refund request within the “Warranty Period” as defined in Paragraph 9 below, of the original purchase date, and LICENSEE used or attempted to use the application for its intended purpose, and RAINWORX is unable to resolve your request then RAINWORX may (at our sole discretion), issue you a refund for the full LICENSE purchase price. If SOFTWARE has not been delivered and LICENSEE submits a refund request, RAINWORX will in most cases honor the request for a full refund, in relation to Paragraph 9 below. RAINWORX provides a functional and extensive online demo, sample code upon request, and unlimited email and phone support during business hours prior to any SOFTWARE purchase. LICENSEE is responsible for ensuring that the SOFTWARE satisfies needed requirements before purchasing software, and any absence of such requirements in SOFTWARE does not classify SOFTWARE as ‘with defect’. In the event that RAINWORX refunds any amounts paid by LICENSEE for SOFTWARE, in relation to Paragraph 9 below, LICENSEE understands and agrees that this Agreement and the License are terminated. Upon License termination, LICENSEE agrees that it will no longer use, display, or otherwise control the Software, code, documentation, and related print or digital media. RAINWORX warrants that for your benefit alone, for thirty (30) days from the day of delivery to you (the "Warranty Period") the SOFTWARE, under normal use in a compatible execution environment, will be free from defects in material and workmanship. This limited warranty extends only to the original LICENSEE. Except for the foregoing, SOFTWARE and accompanying print and digital media is provided “AS IS”. Your exclusive remedy and RAINWORX’s entire liability under this limited warranty will be at RAINWORX’s option to fix the SOFTWARE or refund the fee paid for LICENSE. RAINWORX does not warrant the use of the SOFTWARE will be uninterrupted or error free at all times and in all circumstances, nor that program errors will be corrected. This limited warranty shall not apply to any error or failure resulting from (i) machine error, (ii) LICENSEE's failure to follow operating or installation instructions, (iii) negligence or accident, (iv) is used in illegal activites or any actions in direct conflict with governing law, or (v) has been altered or modified by any person or entity other than RAINWORX. In the event of a breach of warranty, LICENSEE 's sole and exclusive remedy, is repair of all or any portion of the SOFTWARE. If such remedy fails of its essential purpose, LICENSEE’s sole remedy and RAINWORX's maximum liability shall be a refund of the paid license price for the defective SOFTWARE only. This limited warranty is only valid if RAINWORX receives written notice of breach of warranty no later than fifteen (15) days after the warranty period expires. EXCEPT FOR THE EXPRESS WARRANTIES SET FORTH IN THIS LICENSE, RAINWORX DISCLAIMS ALL OTHER WARRANTIES, EXPRESS OR IMPLIED, INCLUDING WITHOUT LIMITATION THE IMPLIED WARRANTIES OF TITLE, NONINFRINGEMENT, MERCHANTABILITY AND FITNESS FOR A PARTICULAR PURPOSE. LICENSEE is responsible for ensuring that the SOFTWARE satisfies needed requirements, and any absence of such requirements in SOFTWARE does not classify SOFTWARE as ‘with defect’. TO THE MAXIMUM EXTENT PERMITTED BY APPLICABLE LAW, IN NO EVENT WILL RAINWORX BE LIABLE FOR ANY INDIRECT, SPECIAL, INCIDENTAL, OR CONSEQUENTIAL DAMAGES ARISING OUT OF THE USE OF OR INABILITY TO USE THE PRODUCT, INCLUDING, WITHOUT LIMITATION, DAMAGES FOR LOSS OF GOODWILL, WORK STOPPAGE, COMPUTER FAILURE OR MALFUNCTION, OR ANY AND ALL OTHER COMMERCIAL DAMAGES OR LOSSES, EVEN IF ADVISED OF THE POSSIBILITY THEREOF, AND REGARDLESS OF THE LEGAL OR EQUITABLE THEORY (CONTRACT, TORT OR OTHERWISE) UPON WHICH THE CLAIM IS BASED. IN ANY CASE, RAINWORX’S ENTIRE LIABILITY UNDER ANY PROVISION OF THIS AGREEMENT SHALL NOT EXCEED IN THE AGGREGATE THE SUM OF THE LICENSE FEES LICENSEE PAID TO RAINWORX FOR THE PRODUCT GIVING RISE TO SUCH DAMAGES, NOTWITHSTANDING ANY FAILURE OF ESSENTIAL PURPOSE OF ANY LIMITED REMEDY. SOME JURISDICTIONS DO NOT ALLOW THE EXCLUSION OR LIMITATION OF INCIDENTAL OR CONSEQUENTIAL DAMAGES, SO THIS EXCLUSION AND LIMITATION MAY NOT BE APPLICABLE. RAINWORX IS NOT RESPONSIBLE FOR ANY LIABILITY ARISING OUT OF CONTENT PROVIDED BY LICENSEE OR A THIRD PARTY THAT IS ACCESSED THROUGH THE PRODUCT AND/OR ANY MATERIAL LINKED THROUGH SUCH CONTENT. ANY DATA INCLUDED IN A PRODUCT UPON SHIPMENT FROM RAINWORX IS FOR TESTING USE ONLY AND RAINWORX HEREBY DISCLAIMS ANY AND ALL LIABILITY ARISING THEREFROM. THE EXTENT OF RAINWORX'S LIABILITY FOR THE LIMITED WARRANTY SECTION SHALL BE AS SET FORTH THEREIN. This LICENSE shall last as long as you use the SOFTWARE in compliance with this LICENSE. RAINWORX may terminate this LICENSE if you fail to comply with any of the terms and conditions herein. In such event you agree to remove and destroy all copies of the SOFTWARE and any applicable source code. RAINWORX reserves the right to discontinue at any time any product, whether it is offered individually or as a part of a product suite. However, RAINWORX will fulfill any contractual obligations to provide support for discontinued products that exist as of the date of discontinuation. This LICENSE will be governed by the law of the State of Vermont, U.S.A. and controlling U.S. Federal law, without regard to the conflict of laws principles thereof. No choice of law rules of any jurisdiction will apply. LICENSEE hereby consents to the jurisdiction of such laws. The Uniform Computer Information Transactions Act and the United Nations Convention on the International Sale of Goods shall not apply to this Agreement. If any provision of this LICENSE is to be held unenforceable, such holding will not affect the validity of the other provisions hereof. Failure of a party to enforce any provision of this LICENSE shall not constitute or be construed as a waiver of such provision or of the right to enforce such provision. YOU ACKNOWLEDGE THAT YOU HAVE READ THIS AGREEMENT, THAT YOU UNDERSTAND THIS AGREEMENT, AND UNDERSTAND THAT BY CONTINUING THE INSTALLATION OF THE SOFTWARE PRODUCT, BY LOADING OR RUNNING THE SOFTWARE PRODUCT, OR BY PLACING OR COPYING THE SOFTWARE ONTO YOUR COMPUTER HARD DRIVE, YOU AGREE TO BE BOUND BY THIS AGREEMENT'S TERMS AND CONDITIONS. YOU FURTHER AGREE THAT, EXCEPT FOR WRITTEN SEPARATE AGREEMENTS BETWEEN RAINWORX AND YOU, THIS AGREEMENT IS A COMPLETE AND EXCLUSIVE STATEMENT OF THE RIGHTS AND LIABILITIES OF THE PARTIES.